Click here for this month’s lay server schedule. Lay persons, usually children and always baptized, who serve in the liturgy as torch bearer, crucifer, thurifer, 1st server, and 2nd server. The 1st server is a senior acolyte who assists the celebrant in setting the table for the Eucharist. They are distinguished by their white albs and red cinctures. Training for acolytes is conducted by Trinity’s vergers. Lay persons who dedicate themselves to tending and preparing the altar and other items in the chancel for the liturgy. There are four altar guild groups at Trinity. The Altar Guild is responsible for cleaning the silver and brass, preparing for all services, and changing the colors of the hangings in the church to conform to the seasons and sacraments. Trinity’s choir leads the congregation in worship through hymns and anthems during the 9:30 services as well as at other select ceremonies during the church year. The adult choir at Trinity is made of volunteers from the parish as well as Cowan Scholars – students from Austin Peay’s music program who supplement their studies by dedicating themselves to the music ministry at Trinity. 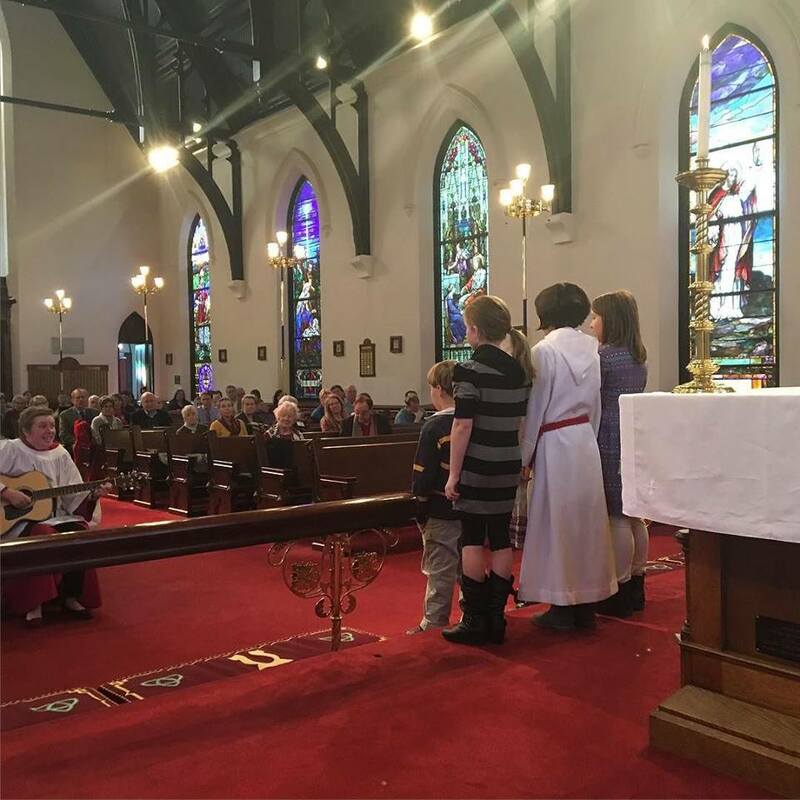 The Children’s Handbell Choir performs during Sunday morning services several times throughout the year as well as special events. Adult acolytes who serve in the Holy Eucharist by assisting with the distribution of the wine. They assist elsewhere in the liturgy. Chalice Bearers must be confirmed Episcopalians, trained in their duties, and licensed by the Bishop. Training for acolytes is conducted by Trinity’s vergers under the direction of the rector. Greeters welcome parishioners and visitors to worship services. They offer guidance and information or assistance regarding the services, as well as other aspects of life at Trinity Parish. The Handbell Choir participates in liturgies several times through the church year. They practice weekly with the three octave bell set. Prior musical experience is not necessary, though it helps. Lectors are lay persons who read the scriptures during the liturgy. They are trained, but are not required to be confirmed to participate in this ministry. In the Sunday services, they read the Hebrew Testament and Epistle, and lead the Psalm. These lay persons lead the Prayers of the People from the nave during the principal service on Sunday. Our ushers extend a friendly welcome to parishioners and visitors at each service. They help seat people, distribute bulletins, pass the alms basins, and assist newcomers in finding their way around the church grounds. Any parishioner may train for this work. Vergers direct and coordinate those involved in our worship services. They are responsible for the smooth and proper conduct of the liturgy by acting as masters of ceremony each Sunday at the principal service. On occasion, the verger may vest and will be distinguished by a black cassock, black chimere, and a verge.